Annapurna base camp trek cost is around USD 620 per guest. The price includes Annapurna Conservation Area Project (ACAP) permit 24$ and TIMS 12$ per person. 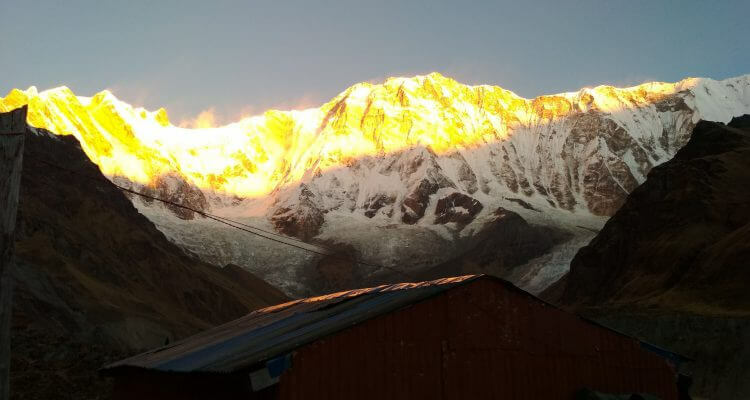 Guide and porter salary also included in the above price for the Annapurna base camp trek. Accommodation will be provided in a tourist standard hotel in Kathmandu and Pokhara. But accommodation during the trek will be at best available tea houses or lodges. Normally, on the trail, the lodge has a single bed or twin sharing bed. We had a great time with the trek team, who both looked after us well. Our guide Ram was very good at adjusting our schedule on the trek, to make the best use of the sometimes bad weather, and taking account of our abilities. The tea houses were better than we expected and were generally well organized too. The hotels organized in Thamel, Pokhara, and Bhaktapur were all perfect for us. The trek up through the forest to the final mountain ridge was very enjoyable, and we did get some fine views of the rain, hail, and snow. and snow.